The mainstream media has a habit of omitting ‘Muslim’ whenever there is a positive story, yet if this was a negative story ‘MUSLIM WOMAN’ would be plastered across as the headline. 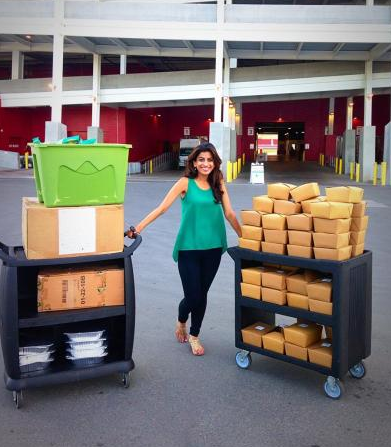 A Californian woman, who developed an innovative phone app, has since helped to feed almost 600,000 homeless people – after she became tired of America’s growing food-waste problem. Three years ago – when she was a student at the University of California, Berkeley –Komal Ahmad – now aged 25 – was walking near campus when a homeless man approached her and asked her for money to buy food. Ms Ahmad, instead, invited the man to lunch and, as they ate, he told how he was a soldier – recently returned from Iraq – and that he had run into a rough patch. After that experience, which, she says, “blew my mind,” Ms Ahmad began an initiative at the university which allowed the dining hall to donate any excess food to local homeless shelters. The initiative became so successful that it expanded to roughly 140 other colleges and universities across America in just three years.